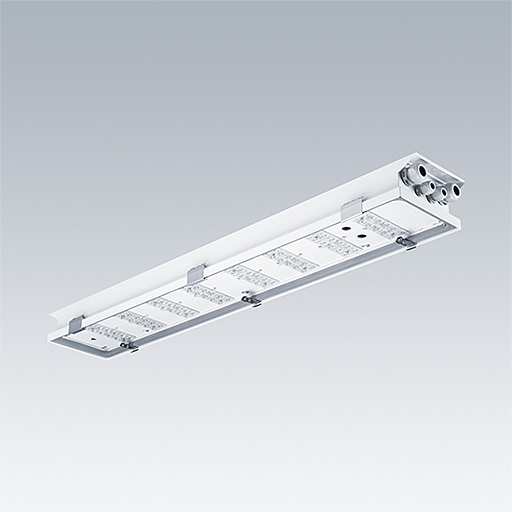 A stainless steel tunnel luminaire with advanced LED technology that can endure highly corrosive and tough environments. Electronic, DALI dimmable control gear driving 72 LEDs at 500mA - the driver is fused. Body: stainless steel, quality 1.4404 / 316L, powder coated white. Enclosure: tempered flat glass, 5mm. To be surface mounted with optional brackets, available on request. Light distribution: Narrow Road. Through wiring of 5x10mm² mains cable is possible through M32 cable glands (suitable for cable Ø13-21mm). A control signal cable can be attached through M20 cable glands (suitable for cable Ø3-13mm). Class I electrical, IP65, IK08. Construction according to EN60598-2-22 for luminaires supplied by uninterruptible power supply. Complete with LEDs. Due to the unique calculation requirements of this product the photometric data is not provided here but design advice may be obtained from your local representative.